Art All Night, Pittsburgh’s annual free art event, pops up in Lawrenceville this weekend for its 17th year. The completely volunteer-run event is held non-stop from 4pm on Saturday, April 26, 2014 until 2pm on Sunday, April 27, 2014. Never heard of Art All Night? The idea behind the censorship-free, non-juried event is to encourage participation from all types of artists. Everyone is welcome to come, share, and experience a variety of local art and activities. Besides original artwork, Art All Night features a live auction, various participatory and collaborative activities, live entertainment, and on-site artwork. Children’s activities are available on 4-8pm Saturday and 10am-2pm Sunday. All artists, regardless of age or skill-level, can submit one piece of artwork to the event. Art must be dropped off between 10am and 2pm on Saturday, April 26 and must be ready to hang or otherwise displayed. Photo ID is required for both drop off and pick up, which is on Sunday, April 27 from 2:30-5:30pm. More information and an online registration form can be found here. Volunteers and donations are what make Art All Night happen each year, so both are encouraged! Each year, a dedicated and talented team of volunteers offers their free time to make the event as incredible and fun as possible. You can sign up for 2-hour shifts before, during, and after the event, for all sorts of tasks, so please do if you have the time! 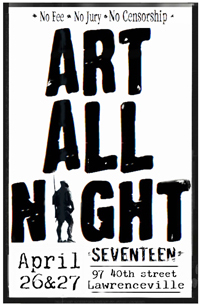 Check out Art All Night on Facebook (including the official Facebook event), on Twitter at @ArtAllNight, and Instagram at ArtAllNightLawrenceville, and don’t forget to hashtag your posts with #ArtAllNight, #AAN17, and #ImAnArtAllNighter. The event is held at 97 40th Street, Pittsburgh, PA 15201, which is a warehouse on the corner of 40th and Willow St in Lawrenceville. Parking might be tough so consider taking public transportation, car-pooling, or catching a Lyft (get $25 off your first ride with that link). Hope to see you there!